Optimum powers of plants and workshops on keramzit production according to technological design norms ONTP 11-86, make respectively 200-400 and 100-200 ths.cub.meters per year. At that, product release is generally arranged with the following rate on fractions: 0-5mm - 10%; 5-10mm — 40%; 10-20mm — 40%; 20-40mm — 10%. Preliminary tests of raw material identify the method, batch composition, production engineering scheme and expected quality of keramzit. The majority of enterprises produce keramzit using plastic method with technological schemes that differ by clay material processing variants and a type of firing furnaces (aggregates). - supply of finished material to warehouse of finished material. The scheme is approximate. 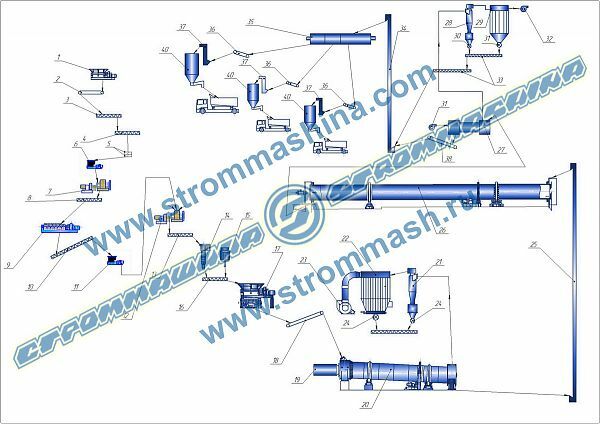 The final content of the equipment and the scheme become known after clay analyses and comparison of its properties with the required data of the customer (fraction size, strength, product specific weight on outlet). Raw material is delivered by dump trucks from pit or cone located near the manufacturing facilities, to warehouse of volume 3500 м3 (eight days stock). Clay is uniformly distributed on the warehouse area by overhead bucket crane and fed for production. Two lines of raw materials reprocessing and gummy granules formation are installed in preparing and forming department as well as clay drying line with enhanced pit moisture. During warm period of time clay can be supplied by dump trucks directly into the receiving hopper of clay ripper of raw material drying line. Loosen clay of higher moisture is directed first to stone-separating rolls and then into the drying cylinder. Dried clay is transported by belt conveyor into receiving hopper of raw material processing line wherein it is being crushed by the coarse grinding rolls, mixed in a clay mixer (blade mixer), whereto if necessary the additive is fed, then additionally crushed by fine grinding rolls with clearance between rolls 1-1,5mm. Prepared mass is transported to the feeder above the forming device for its faultless power supply. Gummy granules formation is performed depending on the technology on a screw press with granulating adapter or in perforated rolls if sandy clay is processed with plasticity index less than 15 or in a plain grainer. The formed granules are rolled away and get dried in a drying cylinder till moisture not exceeding 19%, then they are transported to furnace section for firing in the device (rotating furnace), wherein their swelling occurs at temperature 1150-1250оС. After firing swelled granules first get cooled in the furnace (approximately down to 900...1000оС), and then in a layer cooler (SM1250) down to 80оС. Cooled keramzit is transported by belt conveyors to finished products warehouse wherein it is fed for screen sizing by elevators into the gravel sorter. The fractions received are distributed between the silo canisters by belt conveyors. Crushing assembly unit for large fractions of more than 20mm is provided in the warehouse with subsequent screen sizing in the gravel sorter between the silo. Finished product delivery is provided by automobile and rail way transport. pipeline flow-rate m3 per product ton.